Free-roaming elk near Drake’s Beach. An environmentally harmful bill is swiftly moving through the House of Representatives. 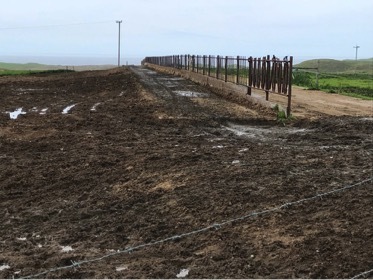 HR 6687 would change the enabling legislation of Point Reyes National Seashore to extend the leases of commercial for-profit dairies and ranches, with no environmental review of cattle grazing impacts. The bill, introduced by Jared Huffman (D-CA) is surprising because it is co-sponsored by Rob Bishop (R-UT), who has been an enemy of public lands and environmental laws. Currently the bill is sailing toward a vote on the floor. No Senate version has yet been introduced. The most egregious part of this legislative maneuver is that it completely undermines the public process. 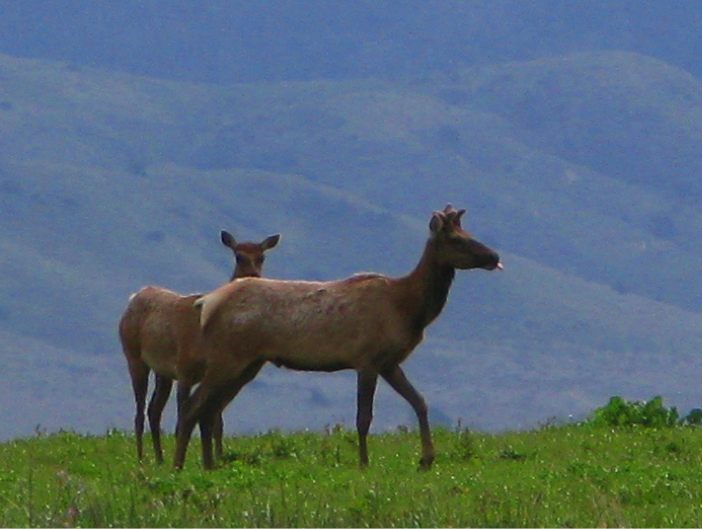 Currently, the park is undergoing a General Management Plan revision, brought about by a lawsuit by Western Watersheds Project, Resource Renewal Institute, and Center for Biological Diversity, after almost half the tule elk (Cervus canadensis nannodes) population at Tomales Point died during the recent extreme drought in California. Most of these elk are locked behind 8-foot tall fences designed to keep them on a narrow spit of land surrounded by ocean, with very few freshwater springs or creeks. A multi-year California drought, peaking in 2015 and 2016, resulted in severe water shortages within the fenced Tomales Elk Preserve, and elk simply had nowhere to go to find drinkable freshwater. Some 250 tule elk died of thirst within the fenced area during the drought. Meanwhile, dairy cattle were well-watered in the “Pastoral Zone” within the park. Dairies and ranches were paid millions of dollars during the formation of the park, and they willingly took the buy-out money and agreed to the livestock retirement process that was to complete the creation of Point Reyes National Seashore. They agreed to relinquish their rights. A 1978 amendment extended livestock grazing “for a definite term of not more than twenty-five years, or, in lieu thereof, for a term ending at the death of the owner or the death of his or her spouse” within this National Park gem. The life-leases have now run their course. But the ranchers and dairies want to stay. But because the enabling legislation was so clear on the point of restoring the land to its natural condition, for the enjoyment of the public, the Marin agricultural groups hired a professional lobbyist to sway Congress to change the law, in intent and in explicit requirements, toward their narrow special interests. This bill now in the House is the unfortunate result. Now Reps. Huffman and Bishop, teamed up with industrial agricultural lobbyists, are trying to change the management of this park without public participation. Their bill would predetermine an outcome for how cattle are managed at Point Reyes, without public comment or input. The reasonable range of alternatives that must be developed for the public to weigh in on, a crucial part of the National Environmental Policy Act (NEPA) process, is transformed into a sham by this legislation. Public comments are needed, as parts of Point Reyes National Seashore are in bad shape: a mud-covered barren dairy feedlot on L Ranch is within Point Reyes National Seashore (see below); hay is trucked in from outside the park and fed to dairy cattle on park land; manure management is an ongoing problem in the park. Is this what we want Point Reyes National Seashore to look like in the future? The Huffman-Bishop bill could potentially enshrine these damaging range management practices indefinitely in a National Park. Dairy feedlot on L Ranch within the “Pastoral Zone” on Point Reyes National Seashore. Is this what we want our national parks to look like? The bill further supports ranchers over wildlife values and recreational enjoyment by allowing free-roaming tule elk to be hunted or removed in the National Park unit to make room for cattle. In 1999, small number of tule elk were relocated into the Phillip Burton Wilderness area—outside the fenced Tomales Point herd—within Point Reyes National Seashore, as part of the re-wilding and restoring efforts of the Park Service. This followed the original enabling legislation which clearly called for restoring a natural landscape across all park lands. The elk were released near Limantour Beach and spread to other parts of these wild areas of the park, lands filled with costal prairie, north coastal scrub, Bishop pine forest, Douglas fir forest, and Pacific Coast beaches. This gives park visitors a glimpse of how truly wild California may have appeared 200 years ago. 140 miles of hiking trails allow visitors access to this beautiful wilderness within the park. The free-roaming elk have since naturally spread to areas near Drake’s Beach within the wilderness. Of course they were originally native here, as Sir Francis Drake’s crew in landing somewhere in the area in 1589 found “heardes of Deere by 1000. in a companie, being most large, and fat of bodie.” The elk herds reminded them of the related red deer (Cervus elaphus) of Europe. To be clear, the elk were here first, and the park was following the mandate set by the people in gradually restoring native wildlife to more of Point Reyes. Because 8-foot-tall fences are not built surrounding the entire boundary of the Phillip Burton Wilderness, these restored tule elk wander onto cattle pastures in the adjacent dairies and beef operations—which is all land owned and managed by the National Park Service. But industrial dairy and beef ranch operators in the “Pastoral Zone,” have vociferously claimed that these free-roaming elk “trespass’ into their park-owned pastures and compete with their cattle for grass, at times damaging wildlife-unfriendly barbwire fences. Sometimes the elk are injured by these barbed-wire pasture fences when they jump them. Is this truly a National Park when native wildlife must compete with domestic livestock? Will the bill introduced by Huffman and Bishop allow the public a say in how native wildlife are allowed to live in this National Park which was created for the people? Orr, R. T. 1950. Early records of Californian mammals. Journal of Mammalogy 31(3): 362. Dairy and beef cattle dominate the surrounding landscape across Marin County on private lands, where the public has no access. Point Reyes National Seashore is a minute percentage of the county, where park visitors can access the natural Pacific coast and view wildlife in native settings. But the agricultural industry wants it all. Therefore, this special-interest bill includes provisions to hunt these free-roaming elk, and gives the park full measure to limit elk in any way possible from entering these cattle ranges. Perhaps tall wildlife-exclusion fences will have to be built to contain the elk to the wilderness portions of the park. How would this impact visitor’s experiences of Point Reyes National Seashore? This is National Park Service land, and these cattle ranges were supposed to be retired long ago and given back to native wildlife, per the original enabling legislation. Some would describe these dairies and ranchers as squatting on public land. During a time when National Monuments are under threat, this bill sets a horrible precedent for how our National Parks and Monuments are managed, diverting the agency away from management that benefits wildlife and enjoyment by the public. In addition, the very public process that our environmental laws enshrine would be endangered. These free-roaming tule elk near Drake’s Beach will be in the crosshairs if HR 6687 is passed in the House. This is so typical, isn’t it? Mankind once again destroying the last vestiges of the wild creatures still left roaming the earth! 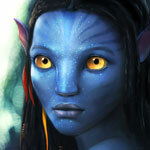 There are so few left and yet, we never get enough!! !